Cranky? Who . . . Me?? My parents were a bit older when they married. I believe WWII and Korea did that to many couples. They rushed to get married, or put it off. Mine met between the two, but Korea definitely pushed it up when my Dad’s regiment got called up. The reason I mention having “older parents” is that while growing up, I was always around “older people”. I can remember especially how cranky most of the “older women” seemed. I wondered why, were they just mean? Were they disappointed in life? Were all their friends and family mean to them? I promised myself I would never be cranky when I became one of those older women. Now mind you, at that young age, most of these “older women” were probably in the late 40’s, early 50’s. I’ve blown way past that age and I don’t feel “old”. But sometimes I do feel cranky. I don’t consider myself mean, I’ve had some challenges in life but I’m not disappointed in life, and most of my friends and family are not mean. So why am I cranky? When I saw the quote above, I had to laugh because it does describe me at my crankiest. I’ve lost patience as I’ve aged. When, in my opinion, things are not being done the way I would do them, I get irritated. I have to stop and remind myself that often there are many ways to do the same thing, and my way may not be the only way or the right way or the fastest way . . . it’s just “my” way. 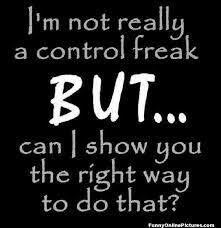 I shall try to be less controlling, as mentioned above. I shall try to be less cranky as admitted to. But if you happen to ask for my opinion . . . well . . .